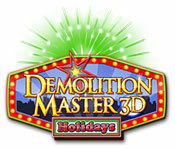 Demolition Master 3D: Holidays is rated 2.6 out of 5 by 10. Rated 5 out of 5 by schubert2 from Excellent Puzzle Game!!! It's clear that people will either love this game or hate it ( in the first 4 reviews two gave 5 stars and two gave 1 star #. It took me a couple of levels before I realized that I could rotate the screen by holding down the left mouse button and moving the mouse. This is very important in being able to place the bombs in the best places. It also took me a couple of levels to understand that you have to leave one bomb unused to achieve 3 stars. I also like playing games in full screen mode. It took me several trial and error attempts on the opening screen resolution dialogue box to accomplish this #be sure to click window mode off #. Once I had the above in place, I was able to settle down to a very satisfying puzzle experience. I'm glad to see a phone app make it's way to the PC. Some of the puzzle apps are very clever and fun to play, but playing them on a big monitor really brings them to life # not to mention much easier control ). I wonder if when expansion packs become available Big Fish will include them in their download # all they would have to do would be to list the latest version number - are you listening Big Fish?). That would be awesome! Rated 5 out of 5 by Ramiress from Amazing! The game is very interesting and exciting. I could play day and night, Lay a bomb to blow up all by using logic. There are different types of bombs and a lot of levels. This is very interesting and will never be boring! I think at this point in time, this game is one of the best I have tasted. Rated 5 out of 5 by OBrai from Awesome game. I recommend it to all fans of puzzles. It’s an unusual game. Here you need to to place the bombs upon the beams in an appropriate way. After this to blow up the whole construction. Really great! Rated 3 out of 5 by latinavixn from Fireworks and blowing things up should equal a good time right? 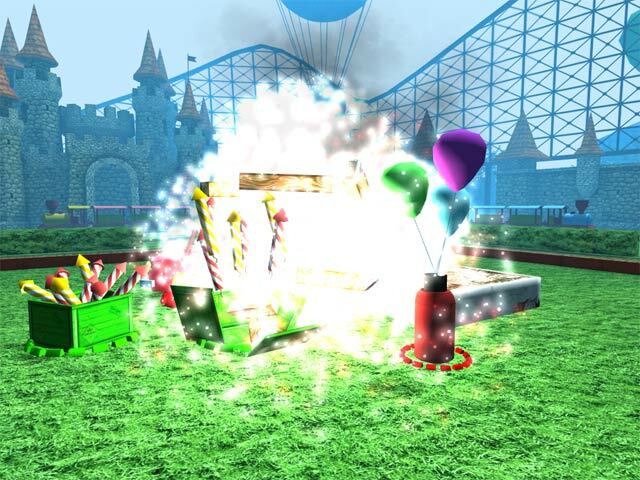 I'm a fireworks addict, I live for the 4th of July, so when I saw that this game had fireworks AND explosions I was pretty excited to download the trial. What a major disappointment it turned out to be. Its a unique idea for a game though, you have to figure out where to place different types of explosives to hit your targets while not hitting other other objects nearby. 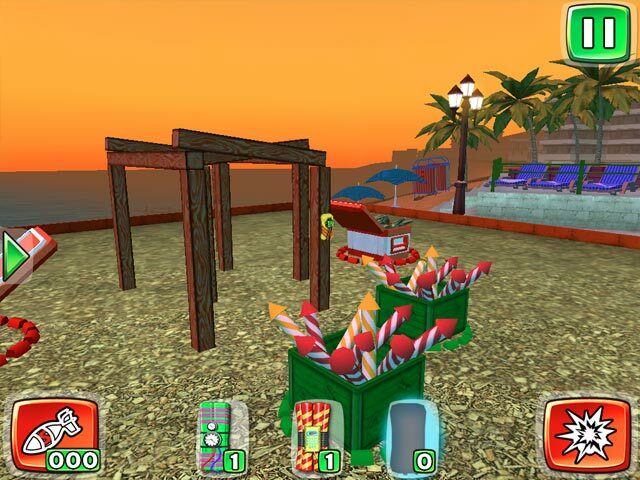 The main objective in each puzzle always stays the same, set off the boxes of fireworks. However they do add goals to certain levels in addition to your main objective. Some of the puzzles have height restrictions for where you can place your bombs, others have steel beams which you cannot place bombs on & which arent affected by the bombs as well, youre also not allowed to damage any red colored objects. They do give you about 4 or 5 super bombs which you can use on some of the harder levels to instantly get through the level. As you move up levels the challenge increases. Ex: A red car on your left, a pile of stacked gifts with the bottom box being red all piled underneath 2 propped up pieces of wood. And 3 planks of wood forming an arch near your target: 2 boxes of fireworks. Youre given 2 regular strength bombs & 2 that are a bit stronger. 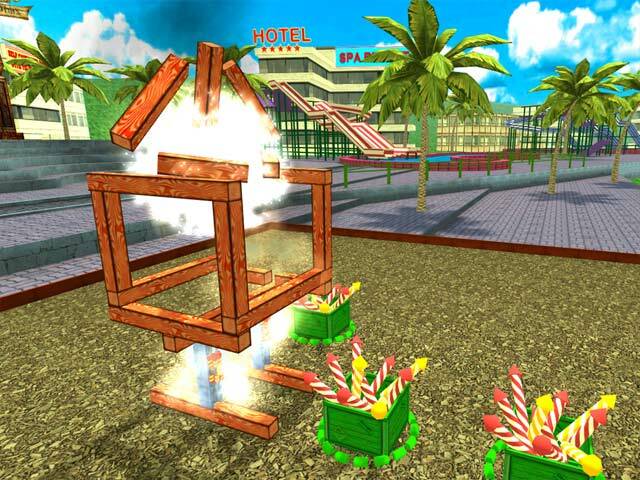 So you have to figure out where youre going to place your bombs on the wood within the height restriction so that they fall and hit the boxes of fireworks to set them off...without damaging the car or the gifts. Which is not as easy as it sounds, in later levels they place the beams so far away from the targets & add so many restrictions that it seems impossible to get off the level without using a superbomb. There is no hint button (at least none that I saw), so you can easily become stuck on levels until you figure them out. The carnival music in the background quickly becomes annoying. The scenic backgrounds are beautiful and well done but after a few levels of just blowing things up it quickly becomes VERY boring. Was OKAY for a trial but definitely not something I'd spend money or even a free token on. Rated 2 out of 5 by Seji from It bombed! I gave this a try after reading all the horrible reviews. They are right. This is a terrible game. Rated 2 out of 5 by tailswhiskers from A very boring game All you do in this game is blow up fireworks. The graphics are good. There is no storyline to playing it. All you do is fix the bombs so that the fireworks will be blown up and that is it. Boring boring boring. I do not recommend this game. Rated 1 out of 5 by florenzo18 from demolition Terrible, awful, I couldn't even get through the try it phase let alone buy it. I deleted it after 6-8 min. of play. Save your money, time and energy. Not worth it !!!! Rated 1 out of 5 by lilyparrish from Didn't like this game at all Unfortunately this game was just a little redundant and boring. I love how big all the graphics were, but that was about it. Sorry. Rated 1 out of 5 by J4016C from DUMB GAME!!! I cannot for the life of me think anything positive about this game..I quit after several minutes into the demo. Please Big Fish do not waste our time on this idiocy! !